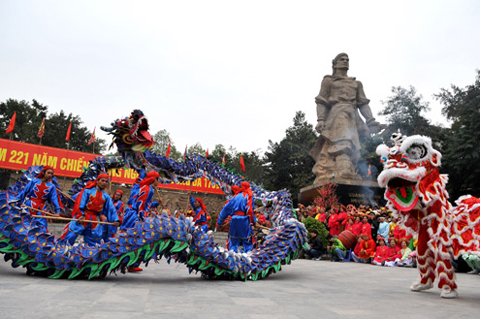 Festive activities are living museums in which typical cultural values of the nation have been preserved for centuries. Traditional festivals constitute a form of cultural activities, a spiritual product which the people have created and developed during the course of history. From generation to generation, the Vietnamese people preserve the fine tradition of “remembering the source while drinking water.” Festivals are events which represent this tradition of the community as well as honour the holy figures named as “gods” – the real persons in national history or legendary persons. The images of gods converge the noble characteristics of mankind. They are national heroes who fought against foreign invaders, reclaimed new lands, treated people, fought against natural calamities, or those legendary characters who affect the earthly life. Festivals are events when people pay tribute to divinities that rendered merits to the community and the nation. Festivals are occasions when people come back to either their natural or national roots, which form a sacred part in their mind. Festivals represent the strength of the commune or village, the local region or even the whole nation. Worshipping the same god, the people unite in solidarity to overcome difficulties, striving for a happy and wealthy life. Festivals display the demand for creativity and enjoyment of spiritual and material cultural values of all social strata. Festivals become a form of education under which fine traditional moral values can be handed from one generation to the next in a unique way of combining spiritual characters with competition and entertainment games. Festivals are also the time people can express their sadness and worries in a wish that gods might bestow favour on them to help them strive for a better life. Preparation: The preparation work is divided into two phases: prior to the coming festive season and in the immediate time before the festive day. The preparation work for the coming festive season starts right after the previous festival comes to an end. When it is coming to the festive day, people need to check the worshipping objects, attires, decoration, and cleaning of the worshipping place and statues. The festive day: Many activities take place, including rituals of procession, incense offering, and rejoicing games, among others. They form the most important and significant part of any festival. These activities also play a decisive role in attracting tourists and deciding the timing of the festival itself. The ending of the festival: The organization board expresses their thanks to all festival goers and closes the worshipping place. 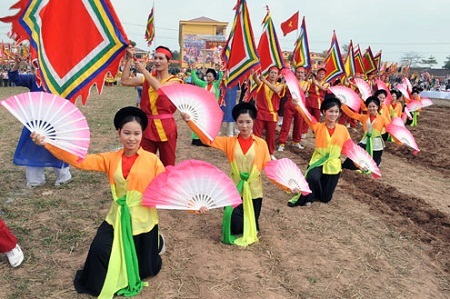 In Viet Nam festivals often take place during the three months in spring and in autumn when people have a lot of leisure time. In addition, the climate in spring and autumn is especially suitable for holding festivals and for festivals goers to enjoy.